is the director of the quantum gravity group at the Centre de Physique Théorique de Luminy in Marseille, France. He is the author of Covariant Loop Quantum Gravity: An Elementary Introduction to Quantum Gravity and Spinfoam Theory (2014) and Seven Brief Lessons on Physics (2016). His latest book is Reality Is Not What It Seems (2016), translated by Simon Carnell and Erica Segre. One of the biggest mysteries in modern physics is something that we experience literally every moment of our lives. Physics describes the world by means of formulas that tell us how things vary as a function of time, but it does not explain what time is. We can write formulas that tell us how things vary in relation to their position, or how the taste of a risotto varies as a function of the ‘variable quantity of butter’. Something about time is different, though. Time seems to flow, whereas the quantity of butter or its location in space does not flow. Where does the difference come from? Another way of posing the problem is to ask: what is the present? We say that only the things of the present exist; the past no longer exists and the future doesn’t exist yet. But in physics there is nothing that corresponds to the notion of the ‘now’. Compare ‘now’ with ‘here’. ‘Here’ designates the place where a speaker is. For two different people, ‘here’ points to two different places. Consequently ‘here’ is a word whose meaning depends on where it is spoken. The technical term for this kind of utterance is ‘indexical’. ‘Now’ also points to the instant in which the word is uttered and is also classed as indexical. No one would dream of saying that things ‘here’ exist, whereas things that are not ‘here’ do not exist. So then why do we say that things that are ‘now’ exist and that everything else doesn’t? Is the present something that is objective in the world, that flows, and that makes things exist one after the other, or is it only subjective, like ‘here’? Illusion or not, what explains the fact that for us time flows? The passage of time is obvious to us all. Our thoughts and our speech exist in time. The very structure of our language requires time – a thing ‘is’ or ‘was’ or ‘will be’. The German philosopher Martin Heidegger emphasised our ‘dwelling in time’. Is it possible that the flow of time that Heidegger treats as primal is absent from descriptions of the world? Some philosophers, the most devoted followers of Heidegger among them, conclude that physics is incapable of describing the most fundamental aspects of reality, and they dismiss it as a misleading form of knowledge. But many times in the past we have realised that it is our immediate intuitions that are imprecise. If we had kept to these, we would still believe that Earth was flat and that it was orbited by the sun. Our intuitions have developed on the basis of our limited experience. When we look a little further ahead, we discover that the world is not as it appears to us: Earth is round, and in Cape Town their feet are up and their heads are down. As vivid as it may appear to us, our experience of the passage of time does not necessarily reflect a fundamental aspect of reality. But if it is not fundamental, where does it come from? At one level, I think that the answer lies in an intimate connection between time and heat. There is a detectable difference between the past and the future only when there is the flow of heat. Heat is linked to probability – the statistical movement of large numbers of particles – and probability in turn is linked to the fact that our interactions with the rest of the world do not register the fine details of reality. The flow of time emerges from physics, but not in the context of an exact description of things as they are. It emerges, rather, in the context of statistics and thermodynamics. This may hold the key to the enigma of time. Objectively speaking, the ‘present’ does not exist in an objective sense any more than ‘here’ exists, but the microscopic interactions within the world prompt the emergence of temporal phenomena within a system (for instance, ourselves) that interacts only through the medium of a myriad of variables. Our memory and our consciousness are built on these statistical phenomena. For a hypothetical super-sensible being, there would be no ‘flowing’ of time; the universe would be a single block of past, present, and future, just as Einstein described. But due to the limitations of our consciousness we perceive only a blurred vision of the world, and live in time. From this limited focus we get our perception of the passage of time. Is that clear? No, it isn’t. There is so much still to be understood. Time sits at the centre of the tangle of problems raised by the intersection of gravity, quantum mechanics, and thermodynamics. We do not yet have a theory capable of drawing together those three essential pieces of our knowledge of the world. A small clue toward the solution, one that also leads to a deeper answer about the nature of time, comes from a calculation completed by Stephen Hawking. Using quantum mechanics, Hawking has demonstrated that black holes have a temperature: They are always hot, emitting heat like a stove. No one has ever observed this heat because it is extremely faint, but Hawking’s calculation is convincing; it has been repeated in different ways, and the reality of the heat of black holes is generally accepted. 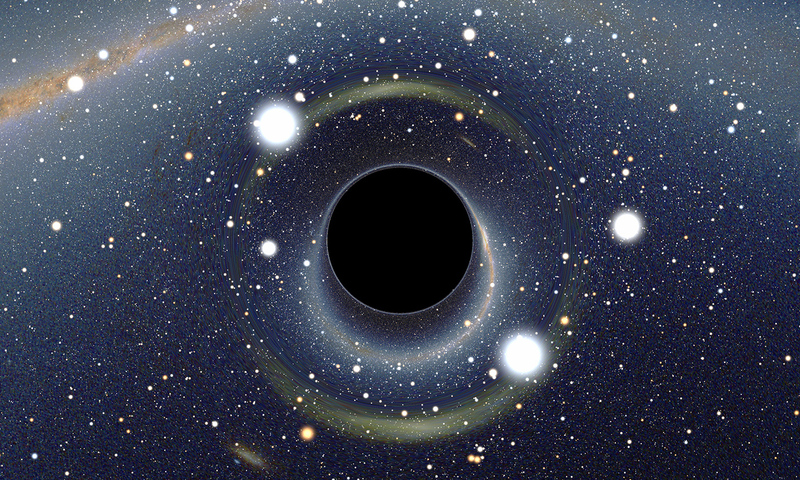 The heat of black holes is a quantum effect upon an object, the black hole, which is gravitational in nature. It is the individual quanta of space, the elementary grains of space, that heat the surface of black holes. This phenomenon involves all three sides of the problem: quantum mechanics, general relativity, and thermal science. It ties everything back to the statistical processes behind the (apparent) flow of time. Physicists have a long way to go to understand it, but with recent advances like the detection of gravitational waves from colliding black holes, they are getting closer. In the end, it seems that the heat of black holes is like the Rosetta stone of physics, written in a combination of three languages – quantum, gravitational, and thermodynamic – just awaiting decipherment in order to reveal the true nature of time. From Seven Brief Lessons on Physics by Carlo Rovelli, published by Riverhead Books, an imprint of Penguin Publishing Group, a division of Penguin Random House LLC. Copyright © 2014 by Carlo Rovelli, Translation copyright © 2015 by Simon Carnell and Erica Segre.